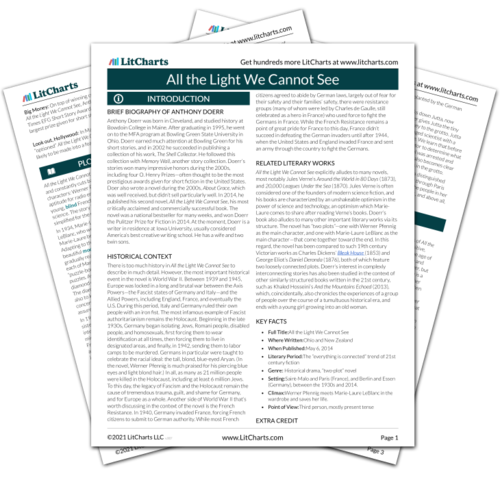 Instant downloads of all 942 LitChart PDFs (including All the Light We Cannot See). 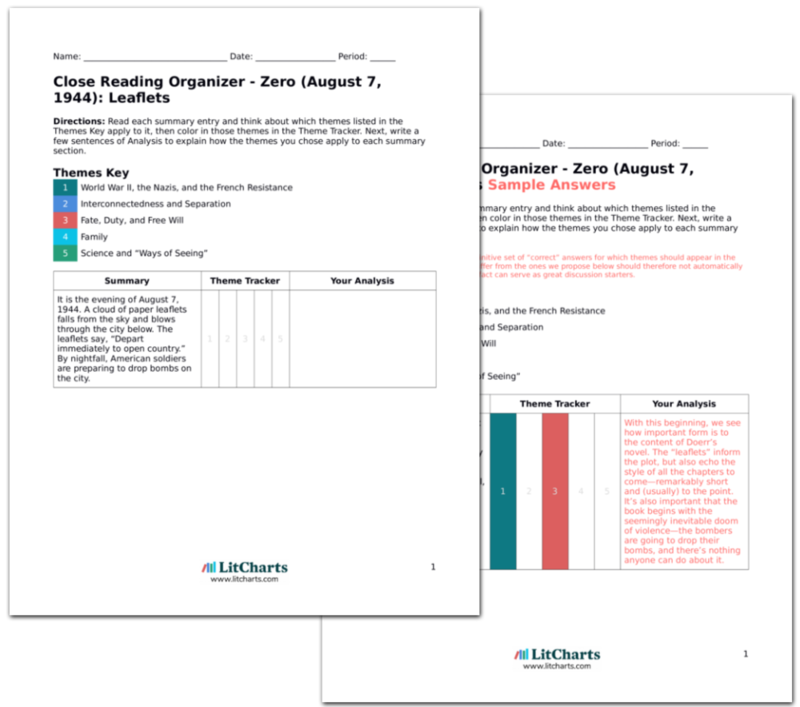 LitCharts assigns a color and icon to each theme in All the Light We Cannot See, which you can use to track the themes throughout the work. Marie-Laure wakes up one day, thinking that her father Daniel has returned from Paris. But this is only the wind—her father has been gone from Saint-Malo for many, many days. Marie-Laure is devastated by this. Madame Manec tries to cheer Marie-Laure up by telling her that the museum will be searching for her father, but nothing can make Marie-Laure feel better. She begins to hate Etienne for not doing more to track down his nephew, and wishes that she could leave the town to track him down herself. Marie-Laure is understandably shattered by the disappearance of her father. She reacts by growing angry at Etienne for his agoraphobia, since it renders him virtually incapable of tracking down Daniel. In a way, this is Marie-Laure’s way of expressing her own self-hatred—she’s blind, and thus just as helpless as Etienne. And even if she could see and he could leave the house, they would still be helpless in the face of chaos that is World War II. Arn, Jackson. "All the Light We Cannot See Five (January 1941): He Is Not Coming Back." LitCharts. LitCharts LLC, 12 Mar 2016. Web. 18 Apr 2019. Arn, Jackson. "All the Light We Cannot See Five (January 1941): He Is Not Coming Back." LitCharts LLC, March 12, 2016. Retrieved April 18, 2019. https://www.litcharts.com/lit/all-the-light-we-cannot-see/five-january-1941-he-is-not-coming-back.